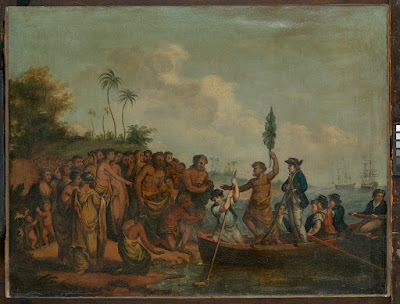 Landing of Captain Cook at Middleburg, Friendly Islands, William Hodges, between 1774-1777, National Maritime Museum. William Hodges, the artist of this painting, was a witness to this scene. Hodges sailed aboard the Resolution with Cook on Cook's second voyage, and documented numerous scenes along the way. According to the curators at the British Museum, Hodges' painting documents Cook landing with his sailors at the island of Eau, accompanied by the Tongan chief Tioonee who bears a plantain leaf aloft. Unlike other paintings of Cook's voyages that I've examined, Hodges' piece gives us a good view of common sailor's clothing. 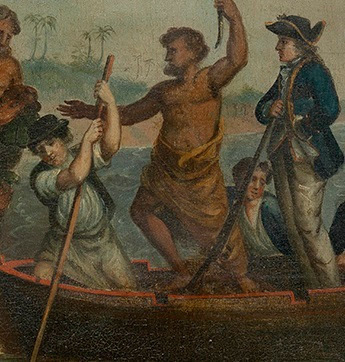 Common sailors are often given little detail in his paintings for a reason: the artist Hodges was trying to document previously unknown people, lands, plants, and animals, not what British subjects were already familiar with. At the bow of the jolly boat is a sailor laying his oar into the sand to slow the vessel. He wears a short brimmed round hat and a waistcoat that hangs open. His white shirt is rolled up well above his elbows, tucked into his petticoat trousers. 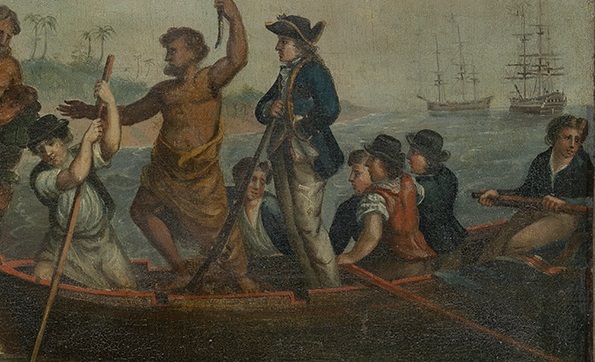 Amidships stands captain Cook leaning on his musket, and between him and Tioonee is a sailor in the water, guiding the boat in by hand. He is bare headed, wearing an open white shirt and an open blue jacket. Aft of Cook are three oarsmen. 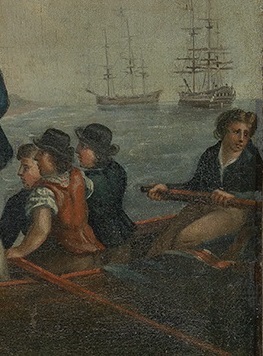 In the foreground is a sailor with a red waistcoat. A black round hat and short brim is atop his head, and a checked shirt is rolled up well above his elbows. The mariner appears is also wearing a dotted neckcloth. Beside him is an oarsmen wearing a round hat and blue waistcoat. Standing in the water and guiding the boat by hand stands a sailor in a blue jacket. At the stern is an oarsman in an open blue jacket and a single breasted waistcoat. This jack wears a pair of trousers and his shirt is notably open, lacking a neck cloth. A quick note on dates. The National Maritime Museum's catalog entry states a wider range than I give the painting. The event depicted occurred in 1774, and so could not have been earlier than that. However, prints of this painting begin to appear in 1777, and so the painting must have been completed or nearly so by then. Thus, my date range differs from that proposed by the National Maritime Museum.